In his 25th signing statement, President Trump this week registered disagreement with what he sees as legislative encroachment on executive branch powers as he signed into law the 2018 Frank LoBiondo Coast Guard Authorization Act. That law (S. 140), named for a retiring New Jersey Republican House member, authorizes appropriations for the Coast Guard and for the Federal Maritime Commission through fiscal 2019, reauthorizes the Commerce’s Department’s hydrographic services program administered by the National Oceanic and Atmospheric Administration through fiscal 2023, and provides for the establishment of uniform standards for the management of vessel discharge. Trump also objected to provisions that “purport to require executive branch officials under my supervision to recommend legislative measures to the Congress,” and reserved the right for his administration to use its own judgment. In previous statements, Trump had voiced disagreements with the use of continuing resolutions to boost overall spending; the 2019 National Defense Authorization Act; and against forcing sanctions against Russia, Iran and North Korea. 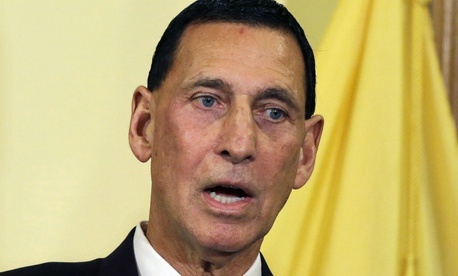 LoBiondo celebrated Congress’s approval of the bill for authorizing $7.9 billion over two years for Coast Guard operating expenses and $2.6 billion for construction, renovation and facilities improvement. It authorizes 43,009 active duty personnel for fiscal 2018 and 44,500 personnel for fiscal 2019, and provides relief for New Jersey fishermen by removing duplicative regulatory requirements shared by the Environmental Protection Agency and the Coast Guard, he said. A House Transportation and Infrastructure subcommittee spokesman told Government Executive he had heard no reaction from lawmakers to the signing statement.